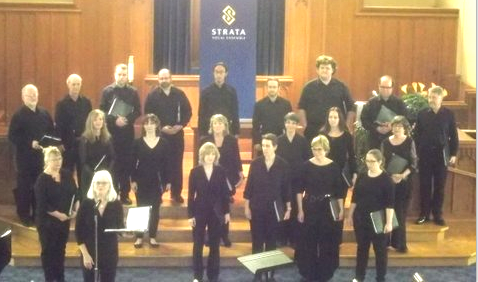 Strata Vocal Ensemble’s tribute to Earth Day, on April 24th, showcased local poets and singers, and offered a wide range of music around the themes of Fire, Water, Earth and Wind. The afternoon was a mixture of spoken poetry and songs ranging from the 13th century poet Rumi to contemporary music by J. Aaron McDermid. The Ensemble’s 22 singers are mostly not professional musicians. Many of them sing in local church choirs, yet their conductor, Gordon Adnams, had them singing challenging and complex music and doing it very well. As icing- MacNeill Baptist Church has excellent acoustics. The concert soprano, Beverly Leslie, introduced the program by saying there would be something for everyone and if an audience member did not like a particular piece, they could wait for two minutes and something else would appear. A dramatic and fiery rendition of McDermid’s acapella music opened the Fire section of the concert, partnered with a reading of a poem by Susan Palo Cherwien. Then the lyrics from Robert Frost’s famous poem, Fire and Ice, caused the audience to ruminate as to which method would destroy the earth. The Fire section wrapped up with a wonderful musical arrangement of an impressive poem by 13-year-old, Patricia Taylor. The second section, Water, opened with another McDermid piece – this time soft, slow and flowing. Erie Lighthouse #3, a poem by Ontario Arts Review’s, Ellen Jaffe, provided a reflection on a waterscape painting from the Art Gallery of Hamilton. The evocative line, “we can hear through the paint the sound of waves”, aptly displayed her talent. A very controlled version of Psalm 42 set to music 500 years ago, by Palestrina, followed, evoking feelings of spiritual longing. Then there were three modern songs which included a lovely male voice version of Aaron Copland‘s, At The River. The Water segment culminated with a lively version of the traditional Down to the River to Pray. After intermission, the Earth section began with another McDermid offering – this time featuring swelling sounds with two haunting soprano solos. In this section, there was also a very robust and happy Henry Purcell song, Linden Lea by Ralph Vaughan Williams (isn’t that the tune played by the Birk’s clock at the Farmer’s Market?) and a reading of William Wordsworth‘s Daffodils that took this scribe right back to school days. The final segment, Wind, began with a reading of Who Has Seen the Wind by Christina Rosetti. The final arrangement by J Aaron McDermid, was partnered with a poem by Susan Palo Cherwien. McDermid’s music is complex and challenging to sing. It matched perfectly with each element showcased. For the wind section, the music was light and ethereal, with a single voice often hanging onto a phrase. Mia Makaroff’s contemporary piece, Butterfly, was varied, appealing and delightful. The published program ended with a syncopated jazzy arrangement of Every Time I Feel the Spirit that had the appreciative audience bopping along. An encore of Ian Tyson‘s Four Strong Winds appropriately wrapped up the concert that was a fitting tribute to Earth Day 2016.